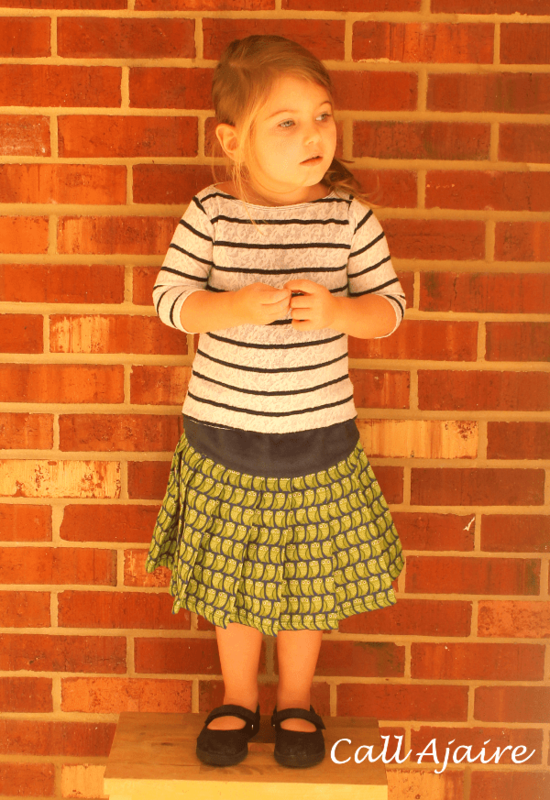 Remember the Betty Skirt Pattern eBook that the Shaffer Sisters released last winter? They have made the pattern even better by adding sizes and perfecting the tutorial and I couldn’t be more excited to be a part of the rerelease. 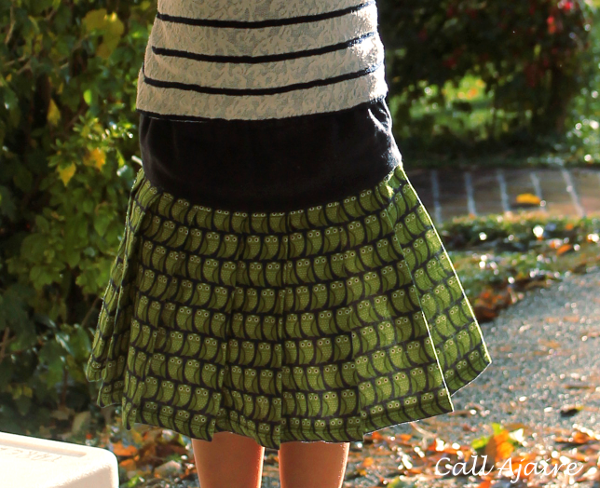 The Betty Skirt is the perfect skirt pattern to have in your stash. 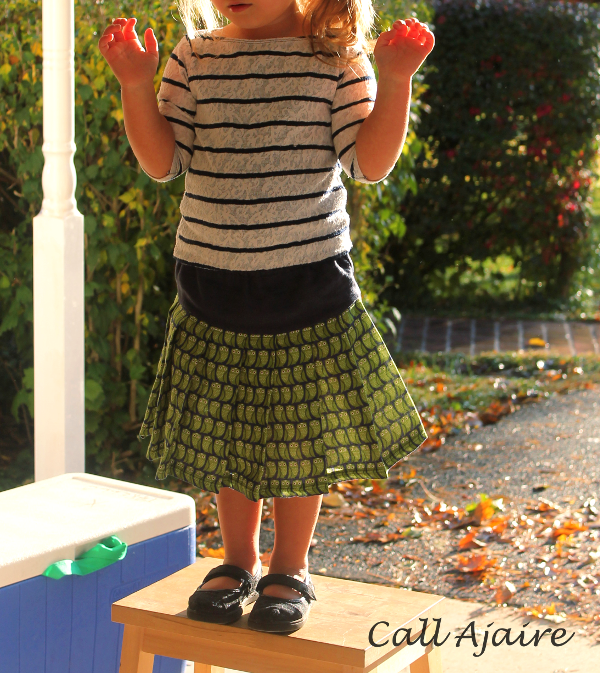 The four skirt options: gathered, large pleats, front placket, and small pleats give you a ton of room to customize. And with the vast size range (newborn to 16X with plus sizes and 18″ doll), you know you’ll be able to make these skirts for years and years. I know I’ve made a ton of these pleated versions (see here and here), but I can’t help myself. I love the high yoke with the pleats. This time I opted for the large pleats so these owls would still be visible and not lost in the pleating. The owls are a double gauze from Imagine Gnats and it is so soft. I used a denim colored linen from my stash for the yoke to give the gauze some stability on top. The size is 4T which Bean is just entering, so though it’s slightly big it’s exactly what I expected. My favorite thing about this eBook is that I can rely on the sizing. I’ve used this pattern to make a lot of gift skirts where there wasn’t a model to use for fitting and I’ve never been disappointed. And we all need a go-to gift pattern right? The Shaffer Sisters are offering a 30% discount using the code BETTYTOUR and you can pick it up here. I promise you won’t be disappointed. I agree, the sizing is spot on! I love your print- I keep hearing about double gauze and how fabulous it is. I'll have to get some soon!